Looked at several dealerships even though we?? ?ve bought our last five vehicles from Nikels, and the end result was coming right back. The used dealership went above and beyond to accommodate both my time and financial considerations. In particular Sales Associate Andrew Medina was beyond helpful by both taking the time to provide me with preliminary numbers on several vehicles and texting me when there was any kind of sales. After four days Andrew continued to help through test drives, comparisons on different models, pricing, and even anwering calls on his days off. Once I finally decided on a vehicle, with no persuasion or coercion from Andrew, the manager (forgot name but really nice guy with beard) quickly got us through the process. It was by far the fastest transaction dealing with a car purchase to date. Trust me on this...I?? 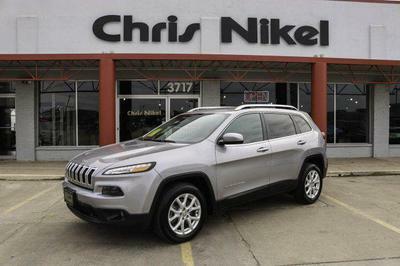 ?ve been to every Jeep dealer within 100 miles and you will not find more fair pricing up front on the vehicle, fair trade value, or a better crew to help you out. I have been a customer of Chris Nikel for several years. They have consistently provided a great experience with a genuine sense of friendship and quality. I truly enjoy the people and environment and feel like the employees provide great service with a genuine attitude versus a fake, ?? ?they make me do this??? approach I?? ?ve encountered with others in the past. Great job Dan, we love it! Everyone at Chris Nikel was friendly and helpful. Connor and Aaron are very upfront and honest gentlemen and very helpful. They both talked all my options out with me to help me make the best decision for my family. I have already recommended this dealership and these two gentlemen to my family and friends. My new Tahoe was washed and fueled up for me so I was ready to cruise town !! Thanks Connor ! I love it ! The Cherokee opens up a little more each day as I become more familiar with its features. All of which could've been remedied by a knowledgable salesman. I’m impressed with the Cherokee. I’ve never owned a Jeep but always liked the style. Drives beautifully, features are great. I feel safe and comfortable. Car is what we were looking for in size. Had a ford, this compared in room and was above in quality. Very well engineered. Wife drives it daily and she is happy with it. Perfect. Easy dealership to work with. Staff was reasonable and not overbearing. They made me a great deal and were understanding of the situation I was in, with recently having my truck stolen.